I have an evil mind. I see into a new business venture. I was recently catching up with a good friend and when asked, “whats been up with you?” I answered with roughly a 15 sentence paragraph describing the 3 businesses I own/co-own, the music venue I’m potentially taking over with a business partner of mine, the online platform I’m attempting to build, going to school full time, and attempting to be a dad/husband. I then said I really should have just got my degree and got a job in a cubicle somewhere. It would’ve been much easier. I’d probably be in some form of management where ever I ended up and would probably be making a decent living with plenty of free time for my family and friends. Life would be much simpler. Fact is, I choose to have the crazy life that I have. But if you ask my family, friends, and my wife, they will tell you I don’t really have a choice. Not if I want to be happy. I have to love what I do. I have to be passionate about it, or else I just won’t last. Money is not the driving force for me, or else I wouldn’t be writing this stuff. I’d be managing a restaurant or still working in the financial/insurance industry, or managing the 18 building facility I ran for a while. I’ve had plenty of well paying jobs and opportunities to grow within companies and build a career. But I didn’t love those careers. You have one life on earth; one journey to take. And you have however long that journey is to be happy. And you have only that long to make an impact on people and leave your legacy. Some people just need enough money to survive in order to be happy. Some people just need a lot of money, regardless of how they gain it. Some people don’t need anything but love. I need to build something of my own and give my family an extraordinary life. I think it stems from my being a musician. Its been a few years since I’ve been a performing musician, but when I was performing I was also the primary song writer in my band. I wrote constantly. I never liked playing cover songs, because I would rather have failed as myself, than succeeded playing someone else’s stuff. I have this need, this burning desire, to build something that creates success. Success not just for me, but for others as well. I think that is the strongest driving force for me; how can I positively affect others? How can I change someone else’s life. A mentor of mine once told me “If you focus your life on helping others succeed, you’ll turn around one day and see a massive pile of cash.” and that has stuck with me for the past 10 years. The craziest thing about this mind of mine is that my family; my wife, my son, my parents, my siblings, my in-laws, they love me now and will love me the same no matter how successful I am or not. My wife is an amazing, simple girl. She doesn’t need fancy things. In fact, she prefers the less fancy things in life. Its one of the things I love most about her. She doesn’t need me to give her more, but I do. And I will. So I’ll continue to work late and work on many things and sacrifice time and energy chasing this dream of mine. I do it because I have a clear vision of what I am working toward and I know what I am working for. If you’ve found that you have this same evil mind, let me offer a little advice on how to tame it and how to use it to your advantage. Its all about vision to me. 1. What is the end goal? What am I fighting for? Paint yourself a clear, concise picture of what you are working for. Can you see your future office? Can you smell the coffee? Can you hear the chatter or music that you’ll be playing? Do you know what your staff will be like? How about your family life; what does it look like? 2. What am I doing today, tomorrow, and everyday after, in order to get there? You need to have goals. You need to have tasks. You need to make lists, check things off, and measure your results. 3. Speaking of results; How do I measure my success? What will you use to measure what works? Is it revenue, impact on community, impact on your family, or some other form of growth? You need to clearly understand and track the methods you are taking and whether they are working or not. Then, re-design your plans to utilize the most effective methods. 4. Is my family on board? Your family can be your husband or wife, your kids, your parents, siblings, or friends. Whatever support system you have; are they on board with you? Do they even know what you’re working for or what you’re doing to get there? Find out what is important to them. Bring them into your vision and paint that picture for them. Trust me, you’re going to fail and you’re going to fall. Your family can be that crucial safety net that catches you before you hit the ground. 5. Am I on board? Yep. I asked it. Are you truly on board with your vision? Do you truly believe in it and in yourself? Do you believe you deserve it? Are you willing to sacrifice what is needed in order to achieve success? If you’re not, that’s okay, but it’s time to move on. If you are, then make sure you remind yourself why you deserve it. Post some pictures or notes for yourself in your closet, or by your dresser, or on your desk. Post pictures of those you’re fighting to give a better life. Maybe a picture of that new house, or that vacation you never took, or that office building you plan to move into one day. Set up everyday reminders for yourself. 6. Am I Scheduling Time For Myself and My Family? This is absolutely crucial. I do a lot of work late at night. I do this because in the evenings, when my wife gets home, I spend time with her and our son. I can’t give them a better life if I never see them. Yes, you’ll sacrifice time with them in order to get there, but it is vital for you to schedule time to be spent with your family. Just last night, I had two phone meetings in the evening/night. I scheduled them just right to allow me about 30 minutes with my wife prior to my first call and a few minutes in between the two. Not only did it give me a chance to hear about her day, but I was also able to tell her about the calls and get her feedback on things. I schedule family time into everyday. I hope you do the same. 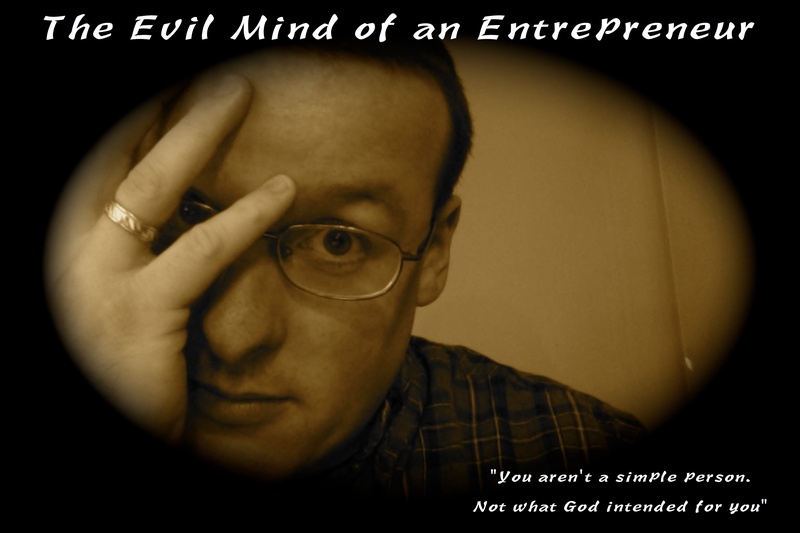 Do you have the evil mind of an entrepreneur? I’d love to hear how you handle it. Please comment, tweet @enimultimedia, or email me and share.